The recent surge in the violent crime rate in Los Angeles after more than a decade of decline, the hostility in inner cities against law enforcement, the high-profile incidents of officers being ambushed, and the protests following shootings by police of unarmed black youths—all take me back to a time when these forces were coalescing in Southern California, but more frequently and more visibly. The early 1990s was a time of unprecedented violence in L.A. There were several factors: the emergence of crack cocaine, the rise of gangs, and the flood of high-powered weaponry on the streets. I was covering crime for the Los Angeles Times and spending most of my time in South Los Angeles, the epicenter of this epidemic of violence. 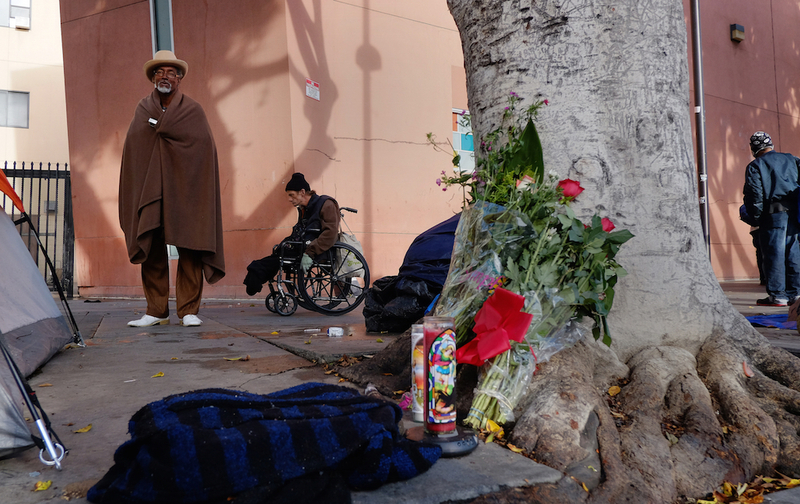 In both 1992 and 1993, there were, each year, more than a thousand homicides in the city (compared to 260 last year) and almost half of them were committed in South L.A. The sinister hissing of flares at a homicide scene. The wails of a mother who’d just been informed by detectives that her son is dead. Hearing on a South L.A. street corner the tat-tat-tat of semi-automatic weapons, coming from different directions. Looking over the shoulder of a coroner investigator as he examined the dead body of a two-week-old baby, wrapped in a ragged blanket, abandoned in a parking lot, her mouth taped shut to keep her from crying. Watching an 11-year-old girl view the body of her mother, a murder victim, at the funeral home shouting, “That’s not my mom … it’s fake!” and then bursting into tears. Looking into the haunted eyes of a 5-year-old boy clutching a Mickey Mouse blanket, who’d been standing beside his father in an alley when he was shot to death. Watching the videotaped murder of a Korean mini-mart owner who cooperated during a holdup and emptied his cash register, but was shot and killed by the robber—wearing a hood, so he couldn’t be identified—for absolutely no reason. Shadowing homicide detectives as they investigated the murder of a 15-year-old boy—an A student who was enrolled in a middle school program for the gifted—the victim of a drive-by shooting. Every day I was witness to a destructive culture of homicide, yet it seemed as if nobody outside of South Los Angeles seemed to care. Most victims did not warrant a single line in the newspaper or a mention in the evening newscasts. Occasionally, on Mondays, I wrote what we called at the time “roundup stories,” in which I simply tallied in a paragraph or two the number of murders over the weekend in the county. On some occasions, there were more than 40. The overworked homicide detectives in South Los Angeles, I believed, were also victims of the violence. The two-detective teams investigated more than 20 cases a year, more than triple the amount recommended by law enforcement experts, and many more than the number that detectives worked in other, less violent parts of the city. At the time, detectives in South Los Angeles had an average of about 80 hours to investigate a “fresh blood” case. And then, whether they had solved it or not, they were on to the next case. I was struck by the injustice and inequality this produced. If a mother in Watts lost a son, she knew that after two weeks, the detectives would no longer be paying much attention to the murder. But if a mother in West Los Angeles or the Valley lost a son, detectives there would have the luxury of spending months on the case. During the time I was tracking detectives in South Los Angeles, a number of them had high blood pressure; others had suffered strokes and heart attacks. The workload became so onerous that in 1995, FBI officials drafted a number of agents to assist South Los Angeles homicide detectives. High profile stories during the past few years have eerie echoes of the 1990s. As I watched TV coverage of the civil unrest in Ferguson, Missouri, after a white police officer shot and killed an unarmed black teenager last year, I thought of the Los Angeles riots in 1992, the most deadly urban riots in our nation’s history. A year earlier, two LAPD officers pounded motorist Rodney King 55 times with their aluminum batons. It was a Simi Valley jury’s 1992 acquittal that sparked the riot. When George Zimmerman, a neighborhood watch volunteer in Florida, shot Trayvon Martin, another unarmed black teenager, and was found not guilty of second-degree murder, I recalled Latasha Harlins, an African-American teenager, who was shot and killed in South Los Angeles during a confrontation over whether she had paid for a bottle of orange juice. The Korean-born shopkeeper who shot Harlins was convicted of voluntary manslaughter, but was given probation and served no jail time. And as I see tensions in black neighborhoods ratcheting up, and assaults against police officer rise, I think back to a time when assaults against police officers were at an all-time high. Sergio Robleto, a LAPD lieutenant, told me that in 1993, LAPD officers were fired on 55 times in a single month. I eventually became so frustrated trying to cover this tsunami of violence, that in the mid-1990s I took a one-year leave of absence from the newspaper to write a book about homicide in South Los Angeles—The Killing Season. I spent my days and nights at homicide scenes, witness interviews, autopsies, and death notifications. I spent my weekends at a South Los Angeles church, sitting in on group-therapy sessions with mothers whose sons had been murdered. The weeks were so hectic and I was filling notebooks so fast, I didn’t have time to reflect on the tragedy I observed every day. I do recall that I had frequent nightmares. People are often reminded in pop psychology books that life is short and nobody is guaranteed tomorrow. That cliché took on a profound meaning for me when day after day I saw dead bodies, surrounded by pools of blood, on streets, sidewalks, alleys, backyards, and front porches; and in cars, trucks, houses, offices, and apartments. Every day, I thought of the Latin phrase, Memento Mori (remember you must die). After covering crime for the Times and writing a book about homicide in South L.A., I realized that I was spending all of my time focusing on the gangsters and drug dealers, and ignoring the young men and women who were the victims, like the young man who was in the middle school “gifted” program. I ended up spending the 1996-1997 school year at Crenshaw High School in South Los Angeles, focusing on a program for gifted students, for a book called And Still We Rise. I soon learned that although these students had managed to negotiate their crime-ridden neighborhood, and eventually prevail, they were all touched by violence. During a class discussion of Hamlet, when the topic of murder and revenge was discussed, every student in the class mentioned that he or she knew someone who had been killed. Talking to the students made me realize the toll this wave of violence took on them, their neighborhood—and on me. I’m relieved that someone else is writing about the violence and the suffering today. Miles Corwin teaches literary journalism at UC Irvine. His latest book is the crime novel Midnight Alley. *Photo courtesy of AP Photo/Richard Vogel.